Chris Grovich, of Black Shoe Diaries, a blog devoted to Penn State athletics, answered some questions for us. distractions. Football-wise, how would you rate this season overall? time since 1966. Who do you like best of the candidates? thanks to the most secretive coaching search in the internet age. candidate confirms that it's okay to go public with that information. BS: The offense struggled greatly, scoring under 20 points a game. who do you think will play quarterback? the season -- Quarterback #1A, really, with Matt McGloin being #1B. be available for the game. makes the group so good and who are the key players? in the top 10-15 of national rankings each year. the bowl game, who would it be? player is going to provide a spark for PSU, it's Belton. Thanks a lot to Chris Grovich. Check his work out at http://www.blackshoediaries.com/ and follow @BSDtweet . Joshua Siegel, of The Daily Cougar, answered some questions about Houston for us. BS: Houston went 12-0 in the regular season, only to fall in the Conference USA championship. 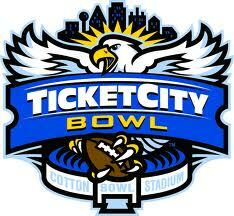 They were headed to a BCS Bowl, and now fall to the Ticket City Bowl. Do you see there being any lack of motivation? Joshua Siegel: No, actually I see quite the opposite. The Cougars have one of the best senior classes in program history this season and they're anxious to get that bad taste out of their mouth and finish on a high note. Also, the players are very excited to play for newly hired head coach Tony Levine. The players love this guy. They'd run through walls for him. BS: Kevin Sumlin has left Houston for Texas A&M. Do you see this affecting the Cougars in the bowl game, and please comment on Sumlin's time at Houston. Joshua Siegel: Coach Sumlin did a fantastic job at UH and he was a great asset to the program. He will be missed in some ways, but I think that by wrapping up the coaching search early and going with an in-house candidate that the players love alleviated many of the problems and distractions caused by his departure. Coach Levine will step right in and do a fantastic job. The rest of the coaching staff remains in place for the bowl game, so little should change in terms of the kind of game you'll see the Cougars play. I think hiring Levine really amped the players up and they'll be back and ready to go against Penn State. BS: The offense, led by record setting QB Case Keenum, averaged nearly 450 yards a game through the air. How important is Keenum to this team and who are his top weapons? Joshua Siegel: Keenum is incredibly important. He's one of the best quarterbacks in the sport and he's a great leader. What makes him and this offense so great is that it is dynamic. He can beat you short or long. He can hit Patrick Edwards for a 40-yard bomb or find Tyron Carrier underneath for a five-yard gain if that's what the defense is giving him. The guy also never turns the ball over. He threw just five interceptions in 534 attempts. That is sick; It's ridiculous. Keenum has a ton of weapons on offense. Edwards stretches the field and is one of the most underrated receivers in the nation. Carrier is great is space on screens and catching balls over the middle. Senior Justin Johnson is about as versatile as they come for an inside receiver. A lot of what makes the passing game so special is that these receivers are also great blockers, which allows UH to get a ton of yards after the catch. Michael Hayes and Charles Sims are also great receivers out of the backfield. BS: The defense was pretty good, but was torched in the season finale. What does this unit have to do to be successful against a physical Penn State offense and who are the key players? Joshua Siegel: The defense will face its toughest test against Penn State. The Cougars excelled against the pass with great defensive backs and a strong pass rush. They're not nearly as strong against the run. The key for UH will be keeping Penn State out of third-and-short situations, so they can use their dime package and force Penn State to throw the ball. With Penn State's uncertainty at the quarterback position, I think the Cougars can be successful if they force them into situations where they have to throw the football. Joshua Siegel: If the Cougars can create those third-and-long situations, I think linebacker Sammy Brown will have a huge impact -- this guy will be playing in the NFL. On offense, I think people are going to be impressed by running backs Charles Sims and Mike Hayes. Both of them are capable of finding the end zone on any play.